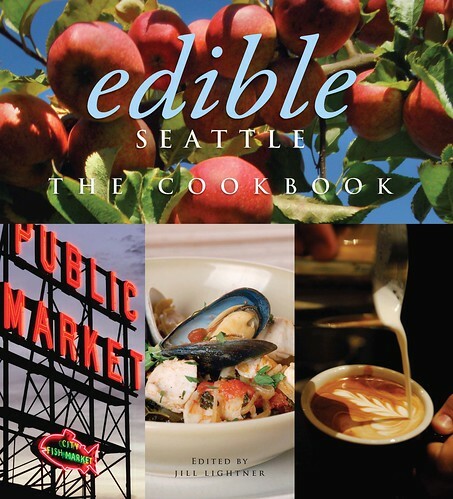 It probably comes as no surprise that Edible Seattle: The Cookbook (edited by Jill Lightner) is full of great recipes centered on local ingredients and the local cooks and chefs who bring them to your table. I also enjoy its readability beyond the recipes, with charming and informative introductions to each recipe, tips on cooking and sourcing ingredients, and page-long profiles of purveyors of note. Hedges Family Estate CMS White paired with Cucumber Sorbet with Chigoku Oysters: Though called “CMS”, this blend is mostly S for Sauvignon Blanc, a particularly oyster-friendly grape. I also think it works well with vegetables and would play nicely with the cucumber sorbet. 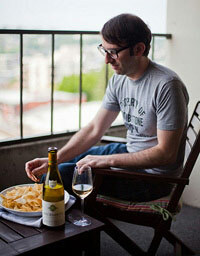 Efeste Evergreen Riesling paired with Marinated Tofu Steak: Tofu and wine? Yes. Tofu is a blank canvas, and with a recipe calling for pungent garlic and ginger, as well as salty soy sauce, the sweetness of a Riesling can tame and balance these flavors. Additionally, I have sampled the Rhubarb Bruschetta (contributed by Lara Ferroni), which as Jill explains, “…is a little like pico de gallo, with rhubarb taking the place of tomatoes.” Though there is no wine pairing with this dish, I think a rosé would be lovely. I’d talk about desserts, but I think I will defer to the expertise of Cake Spy. I will say just because you are having dessert doesn’t mean you have to stop drinking wine. Look for a myriad of great late-harvest wines produced by wineries across the state to indulge your sweet tooth in liquid form. A tip of the hat to Chris Nishiwaki for contributing the wine pairings (there are many more in the book) and another one to Jill for her cider pairings. After all, we grow a few apples here in Washington, too. And it seems a bit criminal not to pair one of the state’s artisan ciders with Apple Crabcakes with Pickled Apple-Fennel Slaw or Cider-Braised Pork with Apples, Onions, and Thyme. Image courtesy Edible Seattle. I received a preview copy of this cookbook. I bought one, too.